Located in the Dallas/Fort Worth (DFW) area, Irving, TX is an integral contributor in a huge Metroplex population of seven million residents. Irving is known as a transportation hub, hosting several major highways, the Dallas/Fort Worth International Airport, as well as light and heavy rail lines. The City is also a center for enterprise, boasting six Fortune 500 company headquarters and ranking third in high-tech startups per capita. It’s one of the most diverse cities in the nation, with more than 50 languages spoken in its schools, which includes the University of Dallas. One way the City of Irving hopes to continue channeling its diversity in a positive direction and bringing the community together is through its website. By September of 2012, their site was no longer fitting the bill. They knew they needed a change. Sloan said the City’s previous website was “dated, dark, and clunky.” Irving’s Web Content Specialist, Angie Kilbourne, said there were several features that didn’t even work anymore. Keeping content updated proved to be a challenge as well. According to Kilbourne, each department had its own content editor. “Most of these employees were not formally trained communications experts, nor technically savvy in website building/maintenance,” she said. To complicate matters, various pieces of content were sometimes used on multiple pages, and when updates were made by the responsible department, they wouldn’t be picked up throughout the site. 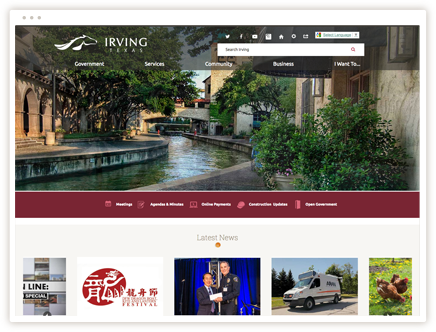 The City of Irving started making plans to upgrade to a responsive site – one that was user-friendly for both the public and the employees who keep it updated. They found that the CivicPlus solution offered the features they were looking for. The Info Advanced module allows Irving to display the same piece of information on multiple pages. Edits are only made by those with permission and publish globally, solving their previous issue with inconsistent updates. “I like the ability to limit the staff’s reach within the site, keeping them out of modules and areas they don’t need access to,” Kilbourne said.